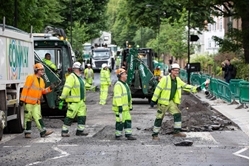 SHABBY ROAD The Beatles’ Abbey Road zebra crossing is DUG UP by workmen for resurfacing. Beatles Radio: The Beatles, Solos, Covers, Birthdays, News The Fab 4 and More! WORKERS have dug up the iconic zebra crossing made famous by The Beatles. The Fab Four were pictured walking over the crossing for the cover of their fabled Abbey Road album — named after the North London recording studio nearby. Workmen pose as The Beatles walking across the iconic Abbey Road crossing. Fans flocked to the site to pick up pieces of rubble being left behind by the resurfacing works as the old paintwork was ripped up.